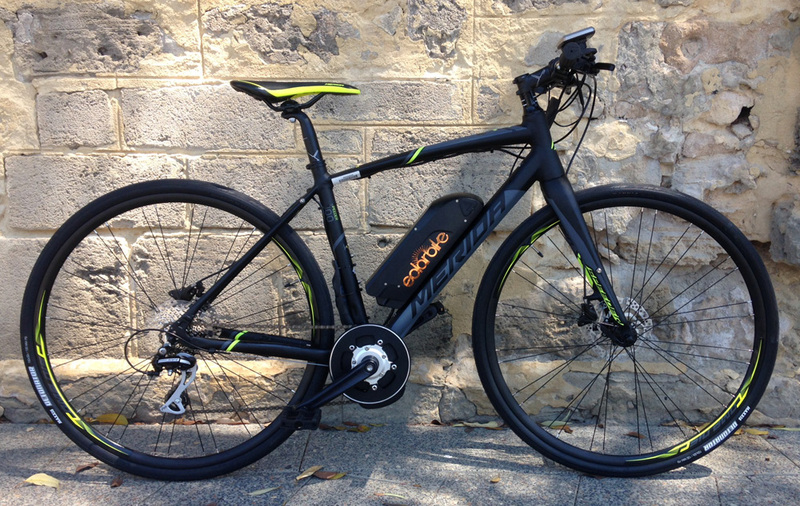 This is the MERIDA Speeder 100 that we’ve made electric using our mini mid-drive conversion kit. It’s a super combination for people wanting a fast electric flat bar road bike at a top price. The bike handles really well and the geometry is designed for speed, comfort and performance. It has carbon forks to make it light and softer over bumps and has SHIMANO hydraulic disc brakes. This is MERIDA’s new 2018 model and it’s proving to be a splendid bike for electric conversion using either a hub motor or a mid-drive motor. Our small mid-drive motor has torque sensing, making it comparable in performance to either the BOSCH or SHIMANO mid-drive system with the only difference being you also get a throttle, are able to control paramaters like power output and set your own speed limits and you can also couple it to any of the latest PANASONIC lithium ion batteries. Please come in for a test ride, hopefully we’ll still have one set up when you get in.